We entered through a postern gate (secondary gate) in the west wall. This gate had a vaulted entrance passage with a murder hole. 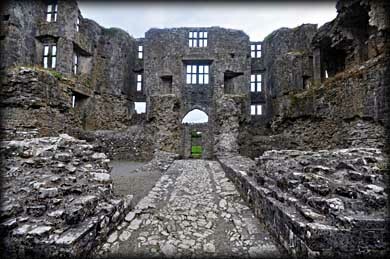 The east gatehouse and the northwest and northeast towers were altered in the late 16th century when large rectangular mullion and transome windows were inserted to create an L-shaped fortified house. 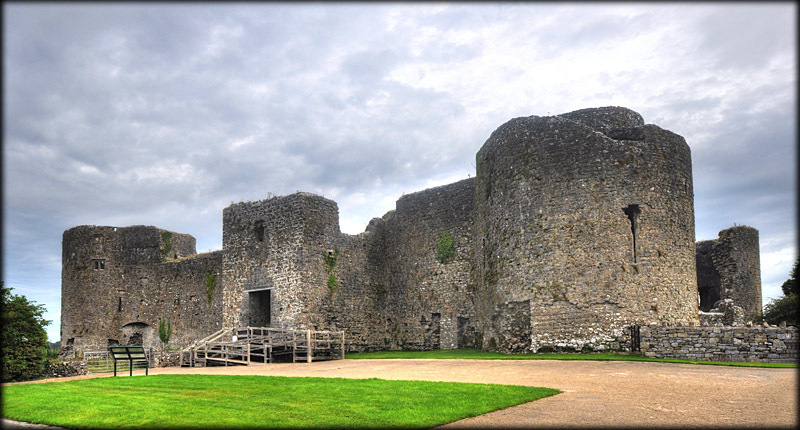 The original castle was built by Richard de Ufford in 1269, but was partly destroyed by King Aodh O'Conor in 1272. The castle was attacked several more times by the O'Conors before being completed in c.1290. In 1394-5 Richard II made O'Conor Don constable. Over the next few centuries the castle moved between various factions of the O'Conors. 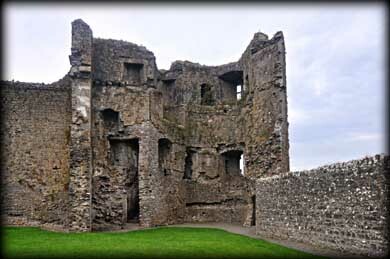 In 1569 Sir Henry Sidney, Lord Deputy of Ireland, took control of the castle and granted it to Sir Nicholas Malbie, the new governor of Connacht. It was Malbie and his son, Henry who remodeled the castle and turned it into a fortified house in the 16th century. The castle suffered badly from Cromwellian forces in the mid 17th century before being finally gutted in the Williamite wars of 1690. The castle is situated on the edge of a turlough. Situated: This was quite tricky to find. As you enter Roscommon from the N61 turn left at the roundabout and right at the next one. Drive up the Main Street to the Square and drive around it turning left onto castle street. Then 190 metres turn left onto castle lane. Discovery Map 40: M 8721 6509. Last visit Aug 2013.